In brief, the story of trash is that we can no longer toss it out into one container bound for the “dump." What a waste to bury it in a landfill, especially on an island where land is so limited. We need to SORT IT OUT into the blue, green and gray containers to enable the City to deliver different components of our trash to recycling and processing facilities that can utilize it to our benefit. Our trash is no longer a waste, it’s a resource for manufacturing new products, creating soil amendments, and generating power. Yes, power – up to 10% of Oahu’s electricity is trash powered, displacing the need for fossil fuels and contributing to our island’s energy sustainability. Our H-POWER waste-to-energy facility receives all of the trash from our homes and businesses. It’s incinerated to produce electricity, which is sold to Hawaiian Electric. This is why low-grade, low-value papers and plastics go into your gray cart. Navigate our website for recycling and disposal instructions via a list of common items. Instructions for households in curbside collection and condo programs. Click to open a one-page pdf file specific to the 3-cart curbside recycling program. Bulky items go out for monthly bulky item collection or to convenience centers or transfer stations and are then brought to H-POWER. Metal appliances are recycled. The 2012 expansion to H-POWER provided additional capacity to process the combustible furniture, mattresses and carpet. Recycling efforts in the construction industry could divert more concrete and rock. Special handling is required for hazardous waste. Disposal is costly and inconvenient. Waste prevention strategies are the most effective: buy only what you need, use it all, use non-hazardous alternatives. Click for tips on reducing what you buy and reusing what you already have. Also, links to reuse organizations. Drop off at multi-material (HI-5 plus) recycling centers. Put in blue curbside recycling carts. Take deposit beverage containers to redemption center to redeem your deposits. Large appliances collected by the City, appliance dealers and private refuse haulers are delivered to a metal recycler. Small appliances can be disposed with regular refuse. Arrange for the appliance dealer to remove your old appliance when they deliver your new one. Place at curb for monthly bulky item pickup. Refrigerators and freezers must be emptied of all food items prior to collection. Drop off at City Convenience Centers or Kapaa and Kawailoa Transfer Stations. Metals are banned from disposal. Commercial entities should deliver directly to the recycling facilities. Reuse options are available for functional units. All junk autos are recycled. To arrange for free auto junking service for your car see the City's Auto Junking website for more information and the Registration Form. To report abandoned autos, call 768-2530. Auto: Give your old auto batteries to the dealer when purchasing new ones or you may take them to a City Convenience Center or Transfer Station. State law requires the dealer to accept and recycle them. Auto batteries are also accepted at Aloha Aina and Going Green events. Rechargeable: Drop off rechargeable batteries from cell phones, computers and power equipment at stores like Best Buy and Home Depot. Also check with battery and recycling companies like Interstate Batteries, Batteries+Bulbs, Battery Bill's, Aloha Overstock or T&N Computer Recycling. See here for listing of companies. Alkaline: Regular alkaline (AA, AAA, D, 9V) can be safely disposed of with your regular refuse collection. Manufacturers no longer use heavy metals in their production. Donate any bicycle with good reusable parts to the Kalihi Valley Instructional Bike Exchange (K-VIBE), a non-profit bicycle shop that serves as an intervention program for the at-risk youth of Kalihi Valley. Drop off bikes when the center is open. 1638 Kamehameha IV Rd. 791-9480. Take unusable bicycles to an Aloha Aina Event for Recycling. Old or obsolete cell phones can be donated to organizations for reuse or recycling. See e-waste page for local drop-off sites. Many companies provide pre-paid shipping labels. Ask your service provider if they have a reuse/recycling program. Donate or recycle at Going Green events. Recycle - see Green Waste. Visit our e-waste page for more information. Flatten boxes; corrugated only. No single layer chipboard such as cereal boxes, detergent boxes, tissue boxes, etc. Drop off at multi-material (HI-5 plus) recycling centers. Put in blue curbside recycling carts. Cardboard is restricted at City disposal sites to no more than 10% per truckload. Large commercial generators of cardboard, including retail operations, can arrange for separate pickup service through recycling companies and haulers. *Please note: The City cannot collect from private, State, commercial or military roads. On City streets in Honolulu area (Halawa to Hawaii Kai) dead animals will be collected by the Refuse Division. Call 768-3200. Hours: Monday-Saturday from 6am-2pm. For after hours and Sunday: email collection@honolulu.gov. Leave name and contact number and you will be contacted Monday. 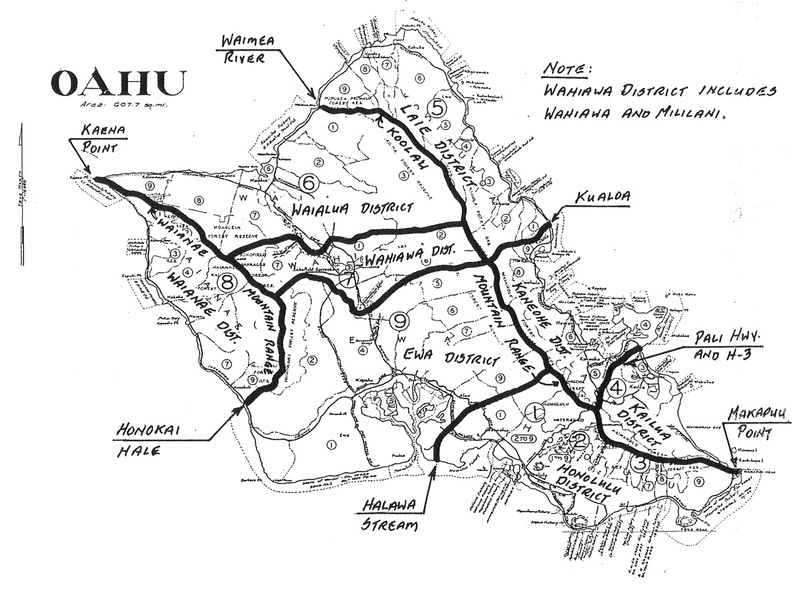 On City streets in rural areas (outside of Honolulu) and in Industrial Areas (e.g. Mapunapuna, Sand Island) dead animals will be collected by Department of Facility Maintenance, Roads Division. See map for Roads Division areas. On State Highways dead animals will be collected by the State Department of Transportation Highways division. Call 485-6201 (available 24 hours). See listing of roads under State Highways division jurisdiction. Dead animals on beaches: Contact the Department of Land and Natural Resources Marine Debris Hotline at 587-0400. Dead animals from homeowners: Less than 70 lbs. Refuse Division will collect. Animals must be placed in an open area which is accessible to the collector. Call 768-3200. Alternatively, these animals can be taken directly to Waimanalo Gulch Sanitary Landfill. Call 668-2985 ext. 110 to schedule an appointment. Dead animals from homeowners: Above 70 lbs. MUST be taken by the resident to Waimanalo Gulch Sanitary Landfill. Call 668-2985 ext. 110 to schedule an appointment. Also see Hawaii Humane Society's Animal Service Directory. Householders may wrap bulbs in newspaper and dispose of with regular household rubbish, or drop off at the City's Household Hazardous Waste bi-monthly event by appointment. Drop off CFLs and tubes at Home Depot Pearl City. Home Depot in Kapolei and Honolulu accept only CFLs. Drop off in collection box located near the returns desk or store exit. CFLs also accepted at Batteries + Bulbs. Businesses must consult the State Department of Health at 586-4226 for disposal guidelines. Place at curb for bulky item collection. Drop off at City Convenience Centers or Kapaa and Kawailoa Transfer Stations. Commercial entities should deliver directly to the H-POWER. Reuse options are available. Rinse, remove and discard lids and tops; okay to leave labels on. Put in blue curbside recycling carts including blue carts at Kawailoa Transfer Station and Waialua Refuse Yard. Take deposit beverage containers to multi-material (HI-5 Plus) recycling centers to redeem your deposits or donate at Going Green or Aloha Aina events. Bars and restaurants are required by law to recycle their glass bottles. Small collectors and recycling companies provide free pick-up service. Local companies make recycled glass products. Place green waste loose in your green cart for recycling collection in automated areas. Drop off at City Convenience Centers or take directly to the composting facility, Hawaiian Earth Recycling, which manufactures mulch and compost products. Leave grass clippings on your lawn when you mow to return nutrients to the soil. Green waste is restricted at City disposal sites to no more than 10% per truckload. Large commercial generators of green waste, including landscapers and property managers, should deliver to the composting facility. Onsite do-it-yourself shredding and mulching is also an option. See the guidelines for proper handling and disposal of Household Hazardous Waste and call the HHW Info-Line at 768-3201 to schedule an appointment for the next drop-off (held every other month) for those items that require special handling. Limited quantities will be accepted from each householder. Commercial generators must handle and dispose of hazardous material in accordance with EPA and State Dept. of Health guidelines. National Medication Take Back Day-April 27, 2019. 10:00am-2:00pm. Click here for more information and locations. Different forms of medications need to be properly disposed of in different ways. See our Household Hazardous Waste page for disposal or Take Back Program options. Medication Drop Box: Year-round drop-off for excess or unused prescription drugs. Oahu's drop box is located at the State Narcotics Enforcement Division - 3375 Koapaka Street, #D-100, Honolulu. Visit the State Department of Health website or the Hawaii Opioid Initiative website for information and up-to-date drop box locations. Look for National Take Back Day in 2019. For more information on proper disposal visit www.dea.gov or call 541-1930. Or visit ag.hawaii.gov or call 837-8470. Put all metal cans in your blue curbside recycling cart or drop off at multi-material (HI-5 plus) recycling centers. Large metals from commercial generators are banned from City disposal facilities and should be delivered to a metal recycling company. Also see Appliances. Remove magazines and glossy inserts. Drop off at multi-material (HI-5 plus) recycling centers. Put in blue curbside recycling carts. Some recycled products are locally made. Take to Air Liquide: 842-4125 (Kalihi), 682-2100 (Campbell) AirGas: 842-2142, or Refrigerant Recycling: 682-1555 for safe disposal. Small quantities generated at home can be disposed of with your regular household rubbish. Latex paints can be hardened in the can, then thrown away. Oil-based paints must be solidified with an absorbent material, such as shredded paper, old rags, or sawdust, then sealed in a plastic bag. An oil change box provides the same results. Commercial generators must handle and dispose of paint in accordance with EPA and State Department of Health guidelines. Some grocery stores provide collection boxes for recycling plastic bags. We suggest calling before hand to confirm if a particular store accepts plastic bags for recycling. Reuse plastic bags for containing refuse. Knot bags before disposal to prevent them from becoming windblown. Look for the plastic number code in the triangle embossed on containers. Number 1 and 2 plastics include all bottles, such as beverage, detergent, shampoo, vitamin; and some other container types as well. More information on plastic numeric codes. 5 gallons: Do not dispose of in trash. If propane tanks get into H-POWER, they may explode! Take propane tanks, empty or full, to a City Convenience Center or Kapaa and Kawailoa Transfer Stations. Refill and reuse tanks or exchange your empty tank for full one. Any remaining gas will be removed and the metal container is recycled. Less than 5 gallon propane or butane canisters: Attach to your portable stove or grill and burn off any remaining gas. Bag and dispose of in your regular trash. Look to donate or give away any unused containers. Do not dispose in trash. Not accepted at City Convenience Centers or Transfer Stations. Deliver to the Waimanalo Gulch Sanitary Landfill (Ewa). Commercial generators are restricted from the Waimanalo Gulch Landfill and can deliver to crushing/recycling facilities or take to the construction and demolition landfill in Nanakuli. Give your old tires to the dealer when purchasing new ones or you may take them to a City Convenience Center. State law requires the dealer to accept and recycle them. Tires are banned from disposal sites. Commercial generators should deliver to recycling facilities - Unitek. Some recycled products are locally made. Put in gray curbside collection carts or in your building’s dumpster. Place refuse at curb for collection or drop off at City Convenience Centers. Make sure your garbage is secured in bags and container lids are closed to keep your neighborhood litter free. Apartment dwellers - follow directions for disposal provided by property management. Drop off at multi-material (HI-5 plus) recycling centers. Put in blue curbside recycling carts. Commercial and government office buildings are required by law to recycle office paper. Pickup service can be arranged through a recycling company or hauler. Some recycled products are locally made.